The economic policies of Francois Hollande will "have a shockwave effect on Europe" if he becomes president of France, Iain Duncan Smith has warned. The Work and Pensions Secretary told BBC One's Question Time his policies of spending and raising taxes could cause "major ructions" with Germany. But he added it was hard to judge how much of the Socialist candidate's hustings rhetoric would become policy. Mr Hollande is likely to oust Nicholas Sarkozy from the Élysée Palace. The president is behind in the opinion polls ahead of Sunday's run-off vote, but making some ground. Mr Duncan Smith said of Mr Hollande: "He's said he's going to come out, he's going to spend money, he's going to raise taxes, everything he says will suddenly change the French economy. "If he does any of that, it will have a shockwave effect in Europe. I think it could cause major ructions with Germany right now. "The European Central Bank will find itself in some difficulty." 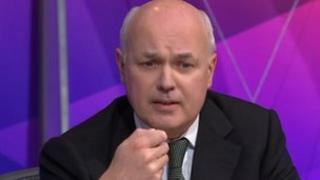 Mr Duncan Smith said Britain could be "badly affected" by Mr Hollande's economic policies. Some analysts say Mr Hollande's chief challenge would be how to deal with German Chancellor Angela Merkel and his other European partners. Much has been made of his desire to promote growth and his unhappiness with the European Union's whole approach to austerity, championed by Mrs Merkel. Mr Duncan Smith added: "If the idea of Francois Hollande is he comes in now with a major set of deficits and with huge debts, to spend huge amounts of money... he'll put a further burden on the taxpayers of France." He said that would saddle European economies with more debt and a greater level of deficit, which meant they would not emerge from this recession. "We rely as much on Europe to trade and we will be very badly affected if this goes badly wrong," he said.